Jack retired as a Senior Engineer from a major west coast electric utility where he specialized in lighting for over 25 years. His main responsibilities were providing assistance to commercial and industrial customers on lighting, training company personnel, and evaluating new lighting equipment. He taught evening classes in lighting design at a couple of community colleges and a course in Illumination Engineering at a state university, and wrote "Applied Illumination Engineering" textbook which was used for those classes. He also wrote a monthly column on lighting for Electrical Contractor magazine, and has authored and presented numerous technical papers on lighting to IEEE, IESNA, and AEE. He has served as an advisor to the California Energy Commission on the development of the lighting portion of their energy code and as a charter member of their Advance Lighting Professional Advisory Group. He is a Fellow of the Illuminating Engineering Society of North America and has served as President of that organization. Much has changed since I wrote the Fine Woodworking article (February 2002, issue 154) on lighting the small shop. While the principles the original article contained remain valid, there have been changes in lamps and ballasts resulting from technological advances, and legislative mandates have outlawed some of the most popular lighting products. Magnetic ballasts for most lamps are being phased out, and the mainstay of fluorescent lamps, the T12's, are meeting the same fate. Some of the common general service incandescent lamps have also been outlawed in favor of more energy efficient fluorescent and LED lamps. The replacement products are for the most part more energy efficient although in some instances they are inferior in terms of performance and generally have a much higher initial cost. We have no choice but to use them, and choosing the ones we use carefully can result in better performance and lower overall costs. This article will focus on lighting the hobbyist or small industrial shop with ceiling heights of 16' or less, using commonly available T8 lamps, and strip or industrial type fixtures. The design method used in this article may also be used for T5 HO (High Output) lamps with the caveat that they are several times brighter than T8's and may cause objectionable direct glare if located within the field of view, so the use of T5 HO lamps should be confined to shops with high ceilings. The minimum height will vary with the size of the shop, with large shops presenting the greatest potential for glare since more ceiling area will be within the field of view as the size of the shop increases. As a general rule I prefer to see them at a minimum height of 14'. Be aware that T5 HO lamps are currently about 5 times the cost of T8's, and fixtures cost almost twice as much. This is somewhat offset by the need for fewer lamps and fixtures. If you are considering using these lamps I suggest a trip to your local big box home improvement store to see them in operation. If you are satisfied that the brightness is acceptable the next step is to determine how many fixtures will work in your shop, and compare the economics between T5 and T8 systems. Light emitting diodes (LED's) are an emerging technology and are also omitted. One of my old dual tube T12 florescent shop light fixtures died. A search at Home Depot found a replacement dusty box in an obscure corner - clearly leftover old stock. The price of the T12 tubes, sold separately, was as high as antique reproductions. Okay, time to upgrade my 20 year old $8 fixtures. The T8 lamps which had replaced T12 years ago were also being phased out, in favor of the newer T5. Buying either a T8 or a T5 fixture and lamps was going to cost at least $30. A Home Depot employee wandered by and said "be sure to check the LED fixtures." Since the long narrow LED fixtures are clearly replacements for the 4 foot florescent fixtures, the rest of the design in Jack's paper should apply. Over the years I have done posts on many forums suggesting the installation of "x" number of fixtures spaced "y" feet apart, and you may have seen one or two where I explain some of the theory behind it. This article will differ in that it will enable the reader to easily determine the number of fixtures that are needed, and provide guidelines on how to lay them out in the space. It will contain some theory but concentrate on the mechanics so almost anyone can follow the blueprint to light a small shop. No one will come out of this a qualified lighting designer but that's not the objective. I'm just trying to improve on what can be done through trial and error, and try to combat some of the misconceptions about lighting that I see on a regular basis on the forums. We'll start with some lighting terminology that will be needed as we progress through the steps to design your own lighting system. Then a brief discussion of how much light we really need based on the kinds of things we do in our shops and the age of our eyes. Then we'll get into the meat of the subject: the lamps, ballasts, and fixture types that best meet our needs. We'll talk about lamp characteristics, circuit types, lamp life, and color temperature and color rendering index. Electronic ballasts are now the norm but there are distinct differences between many of them. For the most part we are at the mercy of the fixture manufacturers since they select the ballasts they install but we do have the option of using another fixture if necessary. This article will discuss the important ballast characteristics that should be considered when we buy a fixture. There are many different kinds of fluorescent fixtures. Some are well suited for lighting our shops. Others are not. I'm not going to engage in a discussion of brand names but I will go over things to consider when picking a fixture. And we'll concentrate on fixtures that are readily available through the big box retailers and lighting distributors. Finally, we will go through a simplified method of determining how many fixtures are needed using a method I developed and taught in my lighting classes to help contractors and lighting sales people come up with a preliminary number of fixtures to help qualify prospective customers. While the method isn't precise it is sufficiently accurate for a small shop. Yeah, this is the boring part. When I took my first class in lighting we spent several hours going over terminology, definitions, and their relationships. I was bored to tears and spent most of that class period wishing I was fishing. It didn't take long to realize, though, that it was going to be tough if I couldn't comprehend the language of lighting. We're only going to cover three basic units in this discussion though, so it wont be too bad. And we're going to discuss them in plain English, not scientific terms, so leave your physics books on the shelf. CANDELA The first building block is the "candela" (cd). It is the unit of luminous intensity and allows us to assign a number value to the brightness of a light. The higher the number, the brighter the light. An ordinary wax candle flame has an intensity of 1 candela when viewed from any angle. It is used in industry as a basis for many lighting calculations. LUMEN The lumen (lm) is the basic unit of a quantity of light. That's not the technical definition but it's pretty close and is a lot more understandable. The light output of a lamp is rated in lumens. The common 100 watt incandescent in your table lamp produces about 1750 lumens. Many 4' T8 fluorescent lamps are rated at 2800 lumens. FOOTCANDLE The footcandle (fc) describes how much light is striking a surface. More light equals more footcandles. By definition one footcandle is equal to 1 lumen of light striking one square foot of surface area. The footcandle is being replaced by the SI (International Standards Institutes) unit of illuminance, the lux. One lux is equal to 1 lumen of light striking one square meter of surface area. A square meter is about 10 square feet so 1 fc is approximately 10 lux. The SI system is largely metric based, so has been slow to gain acceptance in the United States. Therefore this discussion will be based on footcandles and feet. Now let's explore how these units are related and how we can use that knowledge to light our workshops. 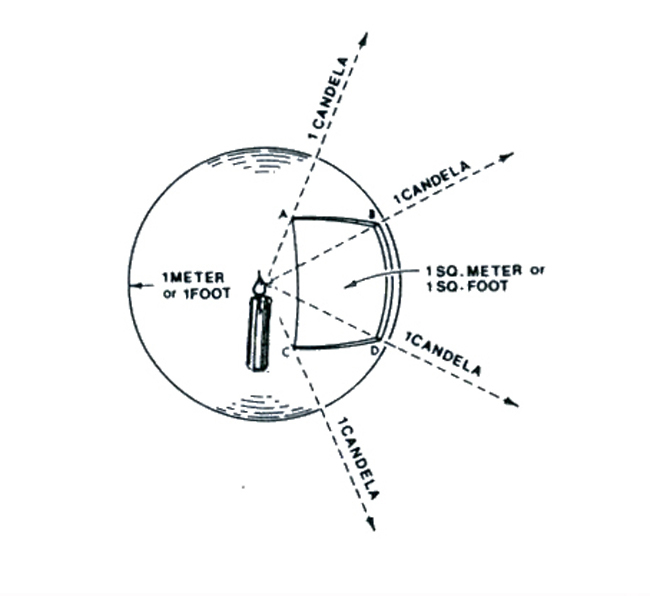 Let's light a common candle and place it in the center of a plastic sphere that has a radius of 1 foot as shown in Figure 1. Now divide the sphere into one square foot areas and measure the amount of light striking each square foot. By definition that amount is one lumen. It is equal to the amount of light falling on an area of 1 square foot, all points of which are 1 foot away from the light source. Since our sphere has a radius of 1 foot it has a surface area of 12.57 square feet and our candle with an intensity of 1 cd produces 12.57 lumens. This helps put the light output of a lamp in perspective. It takes a lot of candles, about 139, to equal the light output of a 100 watt incandescent lamp. Rather than spend several pages discussing the complexities of evaluating visual tasks and quantifying illuminance requirements based on age, the need for speed and accuracy in our work, or the influence of the reflective characteristics of the things we work on I'm simply going to give you my opinion based on over 25 years in the profession. Typical hobbyist and small commercial woodworking shops should be lighted uniformly to levels of 50 or 100 footcandles (fc). Fifty fc for shops with young workers (age 25 or less) where there are no difficult visual tasks like intricate carving, fitting of small precision parts, etc. For those of us over 25 or in shops with more detailed work as mentioned above I recommend 100 footcandles. If we are performing very difficult visual tasks like intricate carving additional light may be needed. This is typically provided by a small task light. The recommended values fall within recommendations published by the Illuminating Engineering Society of North America (IESNA) in their 2011 Lighting Handbook. Note that these are nominal values and a variation of 10 to 20% isn't significant. Why? Because the human eye is an amazingly adaptable instrument. We can see at night in a parking lot under 1 fc or less or on a sunny mountain top with over 10,000 fc at high noon. Small variations in lighting levels are insignificant in terms of visual performance. Unlike incandescent lamps which produce light by heating a thin tungsten wire filament to a very high temperature, fluorescent lamps don't have a filament and operate quite differently. They consist of a glass tube that has had virtually all the air removed and small quantity argon, neon, or other specialized gas injected. Some metallic mercury is added, a wire coil called a cathode is inserted into each end, and the tube is sealed. See Figure 2. The internal pressure is very near a vacuum so the mercury is primarily in a gaseous state, with molecules of mercury floating independently within the tube. The inside of the tube is coated with a powder, called a "phosphor", that converts the UV energy to visible light. Different phosphors are used to produce different colors of light, and the process is much more efficient that heating a wire. Figure 3 illustrates this sequence of events. This discussion will focus on T8 lamps. The "T" indicates that it is a tubular lamp and the "8" denotes the diameter in 1/8ths of an inch so a T8 is 1" in diameter. Quite a bit smaller than the 1½" T12 lamp that was the industry standard for decades. They are available in lengths ranging from 2' to 8' for general lighting however shorter lengths are made for some specialized applications. Four foot lamps are the most common and are preferred for the typical hobbyist or small industrial shop for two good reasons: they are lower in cost, and much easier to handle than 8' lamps -- especially when atop an 8' or 10' ladder. The visual color of a light source is described by its color temperature. Imagine a bar of steel. At room temperature it is a dull grey. Now imagine that the bar is placed in a blacksmith's furnace. As the temperature of the bar rises it begins to change color. First a dull red, then as more heat is applied it progresses to a bright cherry red, then orange, yellow, and finally a bluish white. If we measure the temperature of the bar at any of the colors we can then describe the color of the bar in terms of its temperature, and each and every time we heat the bar to that specific temperature it will appear to be the same color. For example, if we heat the steel to a temperature of 4941 degrees F it will appear to be a warm, soft white with an almost imperceptible tinge of yellow. This will be about the color of a 200 watt incandescent lamp or a 3000K fluorescent. The example, while accurate for purposes of understanding, isn't scientifically correct. In practice we use a theoretical device called a blackbody radiator instead of a bar of steel. The blackbody will perfectly absorb and then reradiate all energy that strikes it. An incandescent filament almost perfectly matches the blackbody within the visible portion of the spectrum so we have visual basis for comparison. Note in the example I cited a temperature of 4941 Degrees F for the bar yet compared it to a 3000K fluorescent lamp. That's because we don't use the F scale to describe color temperature. We use the Kelvin scale, also known as the Absolute scale. 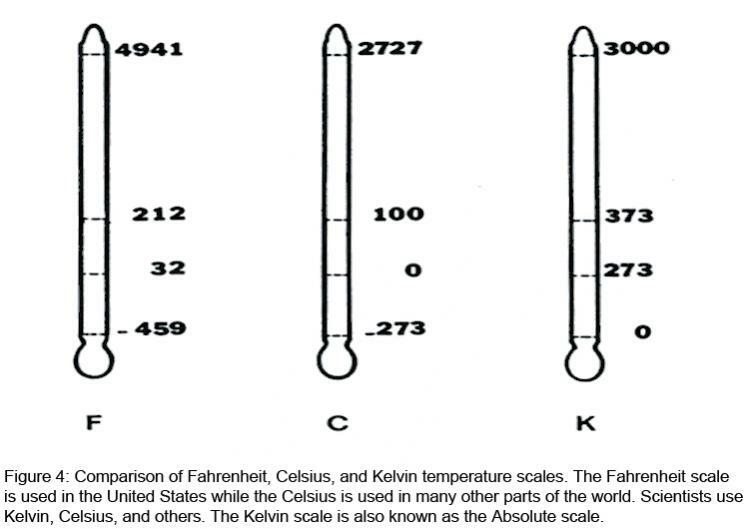 Note that while the temperature in F or C is stated in degrees the temperature for the K scale is stated in Kelvins, not degrees Kelvin. The Kelvin scale uses the same gradients as the Celsius scale but has its zero point at -273C. The two temperatures, 4941 F and 3000K are the same. Figure 4 shows a comparison of the three scales. Color temperature only tells part of the story about how the light from a lamp will make an object look. Unfortunately there isn't a perfect way to describe it but we do have a system that helps. It isn't ideal but it's all we have. It's called "color rendering index" and it describes how well the spectral distribution of the lamp compares to that of a blackbody radiator, typically at eight specific colors. As differences widen between the test lamp and the blackbody the CRI will begin to decrease. In general a higher CRI will provide better color rendering. It is important to note that the lamp and the blackbody must operate at the same color temperature. Comparisons of CRI's between lamps of different color temperatures will be meaningless. For example, incandescent lamps have a CRI of 100 throughout their range of operating temperatures from dimmed to full brightness yet their ability accurately render colors varies widely as the color temperature changes. At 1800 K the lamp produces mostly red light so reds look great and blue colors will be washed out. Increase the temperature to 3000K and blues will look much better and reds will also good. At 4100K blues improve but reds begin to wash out. Selecting a lamp color for your shop is a matter of personal preference and how much you are willing to spend. There are no right or wrong answers. Some stores have displays of several lamp colors and they can be helpful. If you can't find a display and don't already have a preference, 3500K is somewhat neutral and not a bad place to start. Note that there has been no discussion of the screw in compact lamps. They have been purposely omitted because they are simply not a viable light source for lighting an entire shop. If you have a need for supplemental light at a specific location or are looking for a screw in replacement for an incandescent lamp they may be fine, but not for lighting an entire shop. Compared to a T8 lamps they are less efficient, have a shorter life, and are more expensive. Once an electrical arc has been initiated in a fluorescent lamp, the lamp exhibits a negative electrical resistance characteristic: the resistance to current flow through the lamp decreases as the current increases. This "run-a-way" current would destroy the lamp in a few seconds if allowed to continue. An auxiliary device, called a ballast, is required to prevent this condition. In addition to limiting current the ballast provides the proper voltages to start and operate the lamp. Most older ballasts, referred to as "magnetic", contain a current limiting transformer, a power factor correction capacitor, and a thermal safety switch. The transformer consists of coils of copper or aluminum wire wound around a steel core to alter the output voltage. These coils have resistance therefore some electrical energy is lost in the form of heat. This is bad since the heat costs money on your power bill, and excessive heat shortens the life of the ballast, particularly when it is enclosed in a fixture. Magnetic ballasts for most lamps have been eliminated by legislative mandate and have been replaced with ballasts using electronic components to perform the required functions. There were some problems with them during their early days in the 1980's and 1990's but those have been resolved and most current electronic ballasts are highly efficient and very reliable. They have lower internal power losses since they do not utilize transformers. Another, seldom discussed advantage of electronic ballasts is they generally drive lamps at frequencies of 12 kHz or higher which increases the efficiency with which the phosphors produce light. There are many different types of electronic ballasts on the market and they vary widely in performance characteristics. As previously mentioned at the beginning of the discussion of fluorescent lamps, the cathodes which serve as terminals for the arc contain an emission material to provide electrons for the arc stream. These electrons must be heated to boil them off the cathodes. This can be done in either of two ways: independently heating the cathode by continuously applying a low voltage to it, or by using a high voltage to blast electrons off the coils and then relying on heat created by the arc stream to maintain the cathode temperature. The first method is known as "rapid start" and the second as "instant start". Rapid start ballasts provide a gentler boil off of electrons compared to instant start, so lamps tend to last longer when operated in the rapid start mode. The downside is that the independent cathode heating uses power that adds to operating costs, so if all other factors are equal a rapid start system will cost slightly more to operate. There are premium instant start ballasts available that employ circuits to soft start lamps and significantly extend lamp life. Unfortunately we have no control over the specifications for the ballast in the fixtures we buy, so we take what we can get, estimate the number of fixtures we need based on generalities, and pay the power bill. Fortunately, for a small shop, that produces sufficiently accuracy for the design process and the differences in cost are usually insignificant. One final thought on ballasts. Many of the inexpensive shop lights use the minimum components needed to operate a lamp to keep costs down. Because of this they may significantly shorten lamp life and may fail prematurely. I don't recommend them. 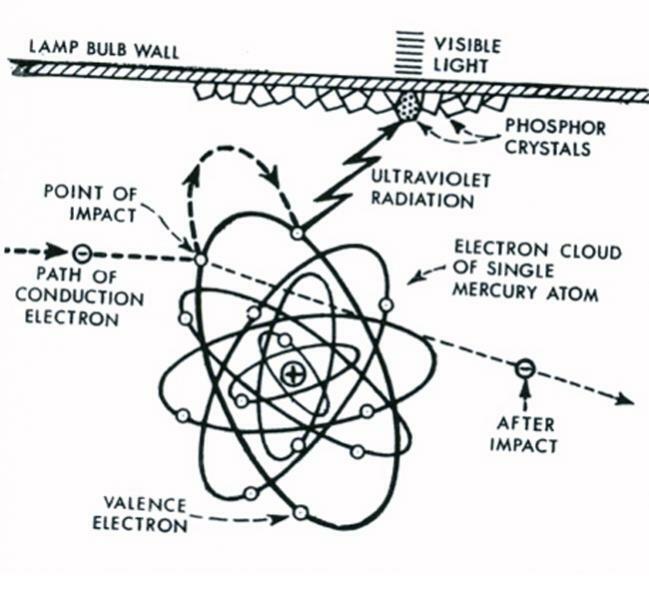 The life of a fluorescent lamp ends when all of the emission material, previously discussed, evaporates from one of the cathodes. This is governed by the ballast type and quality, and the number of operating hours each time the lamp is started. Frequent starts and short burning cycles shorten life while longer cycles extend it. Most ballasts used in industrial grade and medium to high quality consumer products can be expected to drive lamps within the lamp manufacturer's specifications. Inexpensive ballasts used in low priced shop fixtures may not provide the correct voltage and current characteristics and result in low light output and short lamp life. Rated life doesn't mean that each lamp will last that long. It means the point at which 50% of the lamps in a large sample will have failed and the remaining 50% will still be in service. Failures can be expected to begin at 40% of rated life and accelerate to 50% failures at rated life. Theoretically for each lamp that fails early another lamp will last a corresponding time past rated life. Note that I haven't put an hour figure on rated life. That's because it varies greatly by 4' or 8', instant start vs. rapid start circuitry, premium circuitry in the ballast, and the number of hours the lamp is operated per start. In general 4' lamps have longer lives than 8' lamps, rapid start lasts longer than plain instant start, and premium instant start may last the longest. Unlike the days when I entered the lighting profession and you simply went by the single number in the lamp catalog it's now necessary to consult lamp and ballast catalogs for accurate information. If you are buying a fixture off the shelf at a big box retailer just assume 20,000 hours for a 4' lamp and 15,000 for the eight footer and check the manufacturer's literature if you want a more accurate number. This assumes operation for 3 hours per start. Life will be shortened if you turn them off more frequently and extended with longer operating hours. Sorry to be so vague but we would have to append a lot of catalog pages to the article to cover all the possibilities. 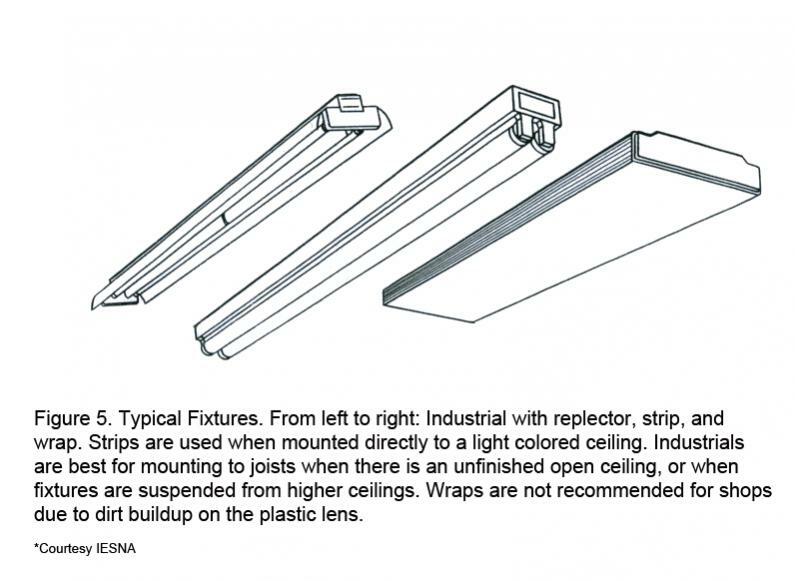 An "industrial" is a strip fixture that is equipped with a reflector to direct light downward. It is recommended for use on unfinished ceilings or when fixtures are to be suspended below the ceiling. The reflector may be white painted metal or specular aluminum. Some reflectors have slots, called "apertures" that allow air to flow past the lamps and through the fixture. The air flow helps keep lamp and fixture surfaces cleaner by carrying dust in the air out of the fixture instead of letting it build up. It also reduces heat buildup around lamps and in the ballast compartment. This increases light output and extends ballast life. The apertures also allow some light to pass through to illuminate the ceiling and help reduce the psychological feeling of working in a cave. They are generally a better choice than reflectors without apertures. Other fixture types that I have seen recommended on forums include "wraps", "troffers", and other office type fixtures. A wrap is simply a strip fixture that has a plastic lens enclosing the lamps. Troffers are the recessed fixtures we see in most offices and some retail establishments. They are equipped with a lens or louvers to shield lamps from direct view and direct light in specific directions. Neither type is recommended for use in woodworking shops since the lens adds two surfaces, the inside and the outside, that will accumulate dirt and decrease fixture performance. The lens also traps heat which can adversely affect lamp performance. Typical fixtures are shown in Figure 5. A final thought on fixtures. You may be tempted to use a strip instead of an industrial with a reflector if your shop construction calls for the industrial. Yes, the strip is lower in cost but it won't perform well unless it is mounted on a white painted ceiling. The first step is to decide what lighting level you want. As previously noted I recommend 100 footcandles unless you are under the age of 25 and will be performing work that is not demanding and is easy to see. If that's the case you may get by with 50 fc or less. Since 100 fc is a more common recommendation that is the value we will use in this example. Next let's calculate how many lamps will be needed using the simplified rule of thumb method which says that 50% of the fixture lumens will reach the work plane when installing open fixtures like strips or industrials in rooms with fairly light colored ceilings and walls. If using enclosed fixtures, which I generally don't recommend for shops, the figure is closer to 40%. Why only 50%? There are several reasons. First, not all of the light gets out of the fixture. Some hits fixture surfaces where it is absorbed and lost. Some light hits the walls and other building surfaces where it, too can be absorbed. That loss can easily be 25% or more. And over time the light output of a fluorescent lamp decreases due to a deterioration of the light producing phosphors and a buildup of tungsten which evaporates from the cathodes and deposits on the bulb wall. On average we can expect the typical T8 system to lose 10% to 15% of its initial output due to depreciation within the lamp. Now that we have accepted that we are going to lose light over time let's see how many fixtures are needed. For this example let's assume a 1500 square foot shop with a 10 foot ceiling painted white, and white walls. How will that fit into the space? If we mount the fixtures end to end in continuous rows we can fit 6 fixtures in a row with one foot left over at each end. In reality a 50' long building won't have 50' of free space inside since the walls take up some of that 50' so 6 fixtures is a good fit. The next question is how many rows. Twenty seven fixtures divided by 6 = 4.5 rows. We can't realistically install half a row so we have a choice of 4 or 5 rows. Before making that choice let's see how they might fit in the space. Good design practice calls for spacing rows even distances apart with the distance from the walls to the closest row 1/3 to 1/2 the spacing between rows. I usually calculate it for ½ and make adjustments if needed later. 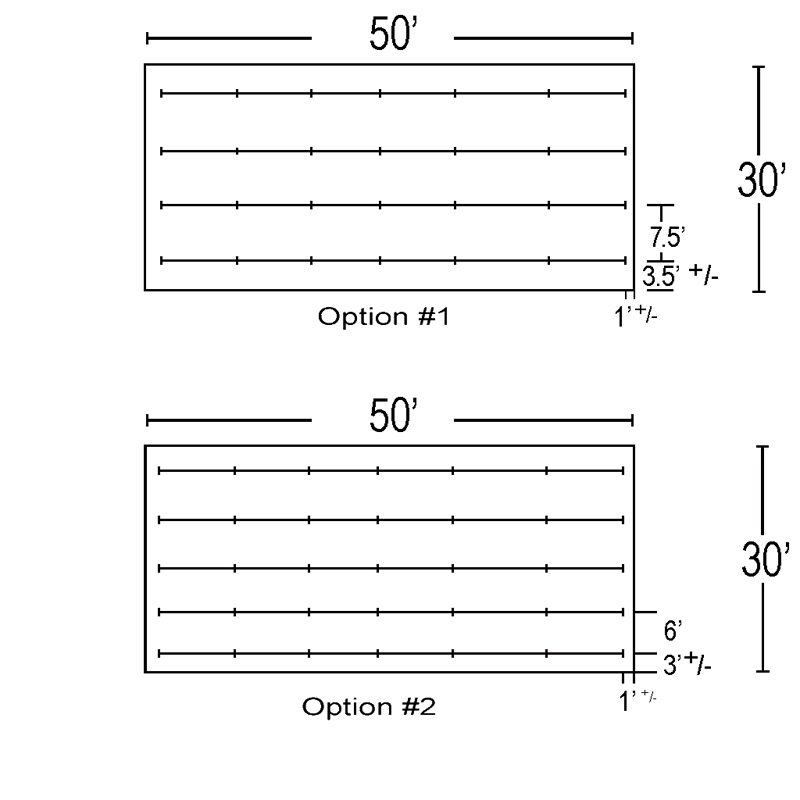 For the first option, 4 rows, divide the total distance, 30' for the example, by the number of rows, so 30/4 = 7.5 feet. This is the spacing between rows and the spacing from a wall to the first row is half that, or 3'8". The 3'8" will actually be less, closer to 3' due to wall thickness but that's ok. It's a good idea to have some fixtures close to walls because we frequently put machines along them. That's where the electrical outlets usually are. The other option is to use 5 rows spaced 6' apart and located about 3' from the walls. The layouts are shown in Figure 6. When determining the spacing it's a good idea to avoid unusual distances such as 7' 2¾". Just round it to 7' and make adjustments next to the walls. The next step is to see if the layouts meet the criteria for providing uniform lighting without dark spots in between fixtures. That's done using something called the spacing criteria, or SC. It provides the maximum spacing between fixtures for uniformity based on the mounting height of the fixtures above the work surface. It is found from manufacturer's catalogs or specification sheets and is given as two values, one for spacing parallel to the lamps, and one for perpendicular. We are mounting the fixtures in continuous rows so we need be concerned only with the perpendicular spacing. Since you probably won't have access to the data, values of 1.5 perpendicular and 1.3 parallel are reasonable assumptions. For the example we have a 10' ceiling. Most workbenches or tables are about 3' high so the mounting height above the work plane is 7 feet. The maximum spacing is then 1.5 x 7' = 10.5 feet. Both of our proposed layouts use closer spacing so either is acceptable in terms of uniformity. It is important to understand that the spacing criteria are not a design guide to determine optimum spacing. It is only used to determine the maximum spacing to achieve a uniform distribution of light within the space. We are now at a decision point. The estimate calls for 27 fixtures but that doesn't fit well into the space. Option 1 calls for 24 fixtures while the other calls for 30. Do we put in 3 too many or 3 too few. I'd go with 24. There's a considerable savings in first cost and ongoing costs for electricity, and fewer replacement lamps over time. We can easily maintain the lighting levels we want by occasionally cleaning the lamps and fixtures. That's because we factored in a decline in light output due to dirt accumulation on the lamps and fixtures, and the gradual depreciation in light produced by the lamps. These losses can be recovered by cleaning and relamping. Routine cleaning once every year or two will help maintain lighting levels in your shop. Note that when the system is new and everything is clean the lighting levels will be higher than the design level. That's normal. The information provided in this paper can't cover all of the possible configurations of shops or all of the various tasks we perform in them, but it does contain guidelines that should be of help for most of them. This document provided through the courtesy of Jack Lindsey, and remains his property. This site (layout and contents) is ©2008-2018 by Charles A. Plesums. The material is free for personal use. Questions? contact us.